was produced by Native Americans in this region long before Colonists arrived at Plymouth Rock. Production has been modernized since then, but the pure special product is the same. South Face Farm has been an active maple producing farm for over 150 years. Our Grade A pure maple syrup has a rich amber color with the distinctive maple flavor for which there is no substitute. Its an essential part of Sunday breakfast, or try it drizzled over ice cream, cereal, or corn fritters. Grade B syrup is dark and strong flavored. Its robust maple flavor makes it perfect for barbecue sauce or for baking. Many people prefer it as their regular table syrup. We follow strict organic and environmentally sound sugaring practices. Our pure maple syrup is an all natural sweetener - we remove nothing but the water, and add only our love and labor. Please fill out this form and click "Purchase" below. Prices include shipping and insurance. For Wholesale Inquiries Click Here. Please be sure to select your shipping region from the popup menu. is a wonderful creamy-smooth spread made from nothing but our best tasting syrup. There is no cream or dairy product in maple cream. Change an ordinary breakfast into a gourmet event with Maple Cream. It's perfect on English muffins or waffles, or as a frosting. Try it in place of jelly on a peanut butter sandwich. Most people just like to eat it off a spoon right out of the jar! It must be sampled to be believed. Money back guarantee if you do not like it! are one of our most favorite items. These are all natural English walnuts coated with a pure maple coating. We absolutely guarantee that you will love these. Its impossible to eat just one! are the perfect way to share the magic flavor of pure maple products with someone special. One of these is sure to please everyone on your gift list, or we can build a custom gift box for you. 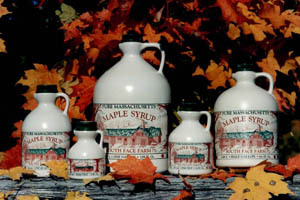 For the real maple lover; includes a quart of premium Grade A maple syrup, a 12 oz. jar of our incredible maple coated walnuts, and a 24 oz. bag of MultiGrain Pancake Mix. Includes one quart of our Grade A pure maple syrup and two 24 oz. bags of 100% natural MultiGrain Pancake Mix. All you need is the Sunday paper for a perfect breakfast! Contains one pint of our finest 100% pure maple syrup, a 24 oz. bag of Massachusetts all natural MultiGrain Pancake Mix, and a 6 oz. jar of our amazingly delicious maple coated walnuts. Contains one pint of delicate Grade A maple syrup and a 6 oz. jar of our irresistible maple coated walnuts. An 8 oz. jar of pure maple cream can be substituted for the maple walnuts if you specify. * Please enter email address for order confirmation. Please fill in your shipping address, if it's different from your billing information. Prices include surface shipping, handling, and insurance (within 48 states). We ship UPS, so we must have a complete street address. For rush delivery service and for orders to Alaska, Hawaii and overseas, please call or e-mail for additional shipping charges. You may phone in your C.O.D. or credit card order. We accept Visa and MasterCard only. For C.O.D. orders, please add $8.00. Our telephone number is (413) 628-3268. We are a small family farm, so you are calling us at home. Often we are doing farm work and cannot be at the house to answer the telephone, so please leave us a message about your request, along with your phone number, and we will gladly return your call. Please call between the hours of 7:00 AM - 10:00 PM Eastern Time. Our Mailing Address is: 755 Watson Spruce Corner Road, Ashfield, MA 01330. You can also e-mail your order to:info@southfacefarm.com. We will confirm your order via return e-mail. If you do not receive a return e-mail confirmation, please call to make sure we received your order. Thank you.